Each walk may be taken on its own, or joined together for a longer walk. The HEART Centre [pictured above] on Bennett Road was previously the home of Headingley Primary School, which moved out in 2006. The School began its life as the Headingley Board School, opened in 1882 after the introduction of compulsory elementary education up to age 13. For many children before the Second World War it provided all their education. 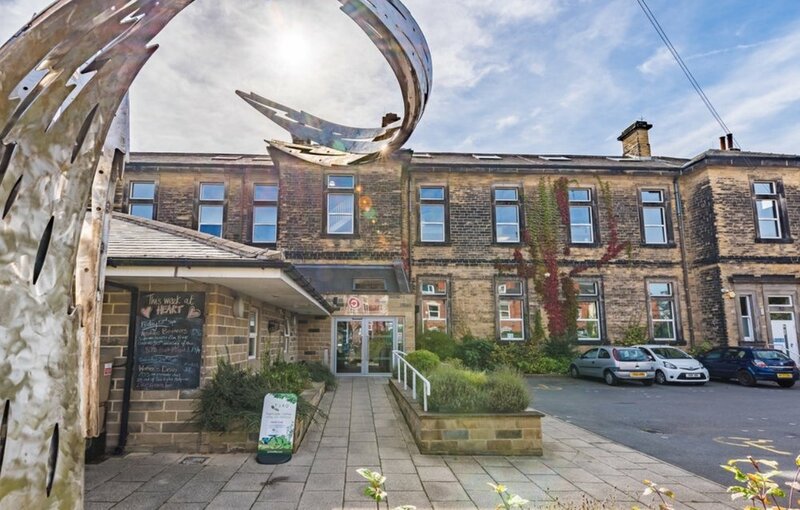 Since the School’s closure the building has been extensively renovated and refurbished by the Headingley Development Trust and opened in 2011 to provide an exciting new resource for the whole community. Start at HEART! From HEART, turn right into Bennett Road, and then right along Otley Road, to the War Memorial. (1) St Michael’s Church is the third church here. The first was a small chapel [pictured left], built on the village green in 1619 to serve Headingley, Burley and Kirkstall. In 1837 it was demolished to make way for a new church [pictured centre], designed by R.D.Chantrell, architect of Leeds Parish Church. Even this was not big enough to seat everyone, and in 1882 the London architect J.L.Pearson (architect of Truro Cathedral) was commissioned to design a new, grander church [pictured right], opened in 1886, ‘proud and prosperous’ (Pevsner), to match what was now Leeds’ premier suburb. Features: Pulpit (sculptor Nathanial Hitch), lectern and screen by Pearson; Madonna carved by Robert Thompson the ‘Mouseman’ from the Shire Oak’s wood, and other work by Thompson; E and W windows by John H Powell; reredos by Temple Moore. (2) The wall of the old Leeds Zoological and Botanical Gardens, flanking the main entrance [pictured right] . The Gardens [original map pictured above] were opened in 1840 with high aspirations, to provide fresh air and recreation for the people of Leeds – 25 acres of lawns, flowers, walks, lakes, and fountains, enclosed by a high stone wall (much still survives along Chapel Lane). Spring Road was built as the access road from Headingley Lane. Attractions included a bear (the turreted Bear Pit remains in Cardigan Road), band concerts, fireworks and hot-air balloon ascents, but the Gardens failed to make money and were finally sold in 1858 as villa sites. Continue down Cardigan Road to the Bear Pit (1841), once on the edge of a lake, where people climbed the towers to throw buns to the bear in the pit behind. A unique survival, it is maintained now by the Civic Trust. Turn back along Cardigan Road to Chapel Lane. Note Clareville (George Corson) and Cardigan House, built 1870 (Edward Birchall), occupied 1877-1886 by John Hawthorne Kitson of the famous Kitson engineering family. (3) Cardigan Road was cut through the middle of the old Gardens in 1868-70, and extended through fields to join North Lane. A small triangle of spare land was left, between Cardigan Road, Chapel Lane and Spring Road, now known as Sparrow Park [pictured right]. The road was named after Lord Cardigan, the notorious 7th Earl, Headingley’s Lord of the Manor, who had died in 1868. The villas [pictured above centre] were built then, with a rural view over cornfields and pasture down to the river [pictured above left]. 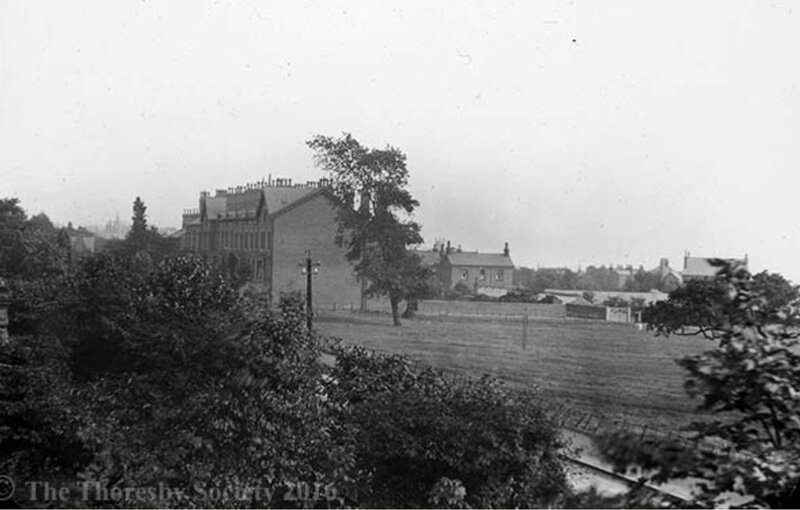 In 1888 when the Cardigan estate auctioned all its property in Headingley, this land was bought by ‘a company of gentlemen’ to create the famous cricket and rugby grounds, which lie behind the houses now on the left. Turn right up Chapel Lane, the ancient route from Burley to Headingley chapel. (4) The Parish Centre [on your left] [pictured left] was originally St Michael’s C of E Primary School until it moved to a new site in Wood Lane in 1978. Its origins go back to 1783 when a small charity school was built on the village green here, by subscription, to teach poor children to read. By 1844 it was too small and poorly funded to cope with expanding numbers and was rebuilt as a National School (C of E). It was extended in the 1870s and 90s. Take a look at the garden at the front – all that is left now of the original village green of Headingley. (5) King’s Place [on your left] [pictured left] – these houses were converted from the original Wesleyan Chapel, built 1834; there are old cottages hidden behind, built in the 17th and 18th century as encroachments on the village green. Continue along St Michael’s Road. (6) Muir Court [on your left] built in the late 18th century, originally with a group of cottages to the side and a ‘skinhouse’ (the builder was a dealer in skins and hides), stables and a garden. There is a stone mounting block still at the front (please note the garden is private). In 1973 the house was bequeathed to the Anchor Housing Trust by Dr Charles and Mrs Irene Muir of Headingley and was named Muir Court in their memory. Continue along St Michael’s Road and cross to the other side. (7) The New Headingley Club (originally called Bleak House) [pictured above], was built in the 1850s for John Eyres, a prosperous grocer with a business in town (clearly a Dickens fan - Dickens came to give several readings in Leeds). In the 1920s and 30s the house was the home of the Director of the Lounge Picture House in nearby North Lane (see 11). Around 1940 it was converted into a Friends’ School and Meeting House (Fellowship House), with a popular youth club, and then for many years housed the local British Legion branch. In 2001 the Club took it over. (8) Westfield Grove, the pair of stone houses on the corner of St Michael’s Road [pictured above], was built in 1842 on ‘the low green’, overlooking fields. The first tenant was Richard Oastler, the famous campaigner for factory reform, who came to live in ‘this lovely spot’ when he was released from debtors’ prison. He is buried with his wife at St Stephen’s, Kirkstall. Look left to see the Carnegie Pavilion (2010) [pictured right] of the famous Headingley Cricket Ground (opened 1890), towering above the houses – sports lovers may want to divert to see the Len Hutton gates. Either turn right into North Lane, and right again into Bennett Road. Return to HEART for tea and biscuits (or similar)! Or cross North Lane at the traffic lights and walk up South Parade to (9) for the North Lane walk.